The Turkish court has rejected the appeal to release Andrew Brunson, who is the alleged US pastor at the center of a dispute between Ankara and Washington. While he has been there for 23 years, his new Church of the Resurrection has existed for less than a year and it had only 25 members. From the photo, it appears that the prayer room consists of about 40 seats. There is no professional pulpit, but drums and a lectern with speakers. Nobody even knows about the financing of the church. 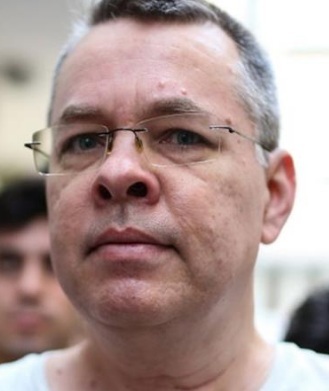 Following the Turkey coup of July 15th, 2016, Brunson was arrested by the Turkish security authorities in October 2016. He was charged with espionage and the attempt to overthrow the Turkish government. According to the newspaper Sözcü , Brunson wrote in an e-mail to a friend five days after the coup: “The Turkish people have not taken sides as usual for the Turkish military. Everything is going badly, but in the end, we will be the winners. “ This one of the statements of Brunson that forms the charges in his indictment. According to the indictment, Brunson also met with the head of the Gülen movement for the Aegean, Bekir Baz, on several occasions before the coup. Brunson apparently told the prosecutor that he did not know a person named Bekir Baz and had never met a member of the Gülen movement knowingly. He has also been charged with being involved with members of the PKK. Brunson also denies trying to help Syrian refugees. The indictment against Brunson also alleged that Brunson was kicked out of the Church of the New Birth between 2008 and 2009 because it did not support terror. He then went abroad for about one and a half months. Brunson then returned to Turkey, and he opened a new church in Alsancak in Bornova Street. Trump demands Brunson back and Erdogan refuses. The question remains if Trump even does know the real story of Brunson and in fact does anyone? It some seem obsessive that Erdogan just does not deport him, send him back to the states, and deny him any right to return. That would end the upfront issue and then the real build-up of tension might pass and relieve Turkey as a nation.